Griff has a new sister - May. And a new basement playroom, almost. So we've been a little busy. So we haven't blogged for a while. The family memories, meanwhile, are coming a mile-a-minute. So stay tuned. Some Vera and Griffin and May related items from the past few months are coming up soon on the blog. 'cause we still love our kids. And this is as much an archive as it is a public announcement service. Wow it’s been a while and we have the pictures but its worth capturing the top memories from Turks and Caicos, where we were for a week and a bit in early May. Vera in the swimming pool “swimming” by herself with the arm floaties and foam vest. She immediately started with cute little legs running underwater and even started lounging back and just floating. Either way, giant smile. Griffin and Vera sharing a room and waking up (and falling asleep) alternately saying “HI!” “HI!” “HI!” with a rising tone accent. Also Griffin occasionally saying “Its okay Vera” or bringing her a stuffed animal or blanket when she cried out. Early mornings and late afternoons/evenings on the beach. In particular the sunset evening on Grace bay beach where we took a bunch of pictures and watched as the tide slowly eroded the defenses of Lookout Point. Lookout Point – a castle we built. The French bakery. And its lovely proprietor who complemented our kids and treated us to a free box of caramels after we spent 10 minutes admiring and purchasing just about one of everything. And eating the stuffed breads. Taylor Bay. The best kept secret just off Sunset Bay Drive. Just walk behind the tennis courts on your left. We’d have missed it except for the tourists from Maine who were unloading their car road-side and showed us the path. Napping Vera in the backpack while I walked three or so miles of grace bay beach. Nissan Sunny. What a P.O.S. rental car – and only $80 per day. Cold Coconut water at the fish fry night. Cats! Officially the hotel staff called one of the semi-domesticated feral ones “Mama”, but Vicki was calling her Nickels. · Lunch. Vicki made egg bake and it was awesome. · I mowed the lawn while the kids were napping, then did some ceiling strapping and framing in the basement. · Water balloon slingshot! We launched probably like 20 balloons high in the air into our own yard and accidentally into the neighbors a few times. · Dinner at Five Guys. Griff and Vera ate a TON of peanuts. · Orange Leaf for frozen yogurt take-out, which we ate in the driveway and did some chalk drawing. · Bath and Bed for the kids. · And then three episodes of Orange is the new Black for mom and Dad. 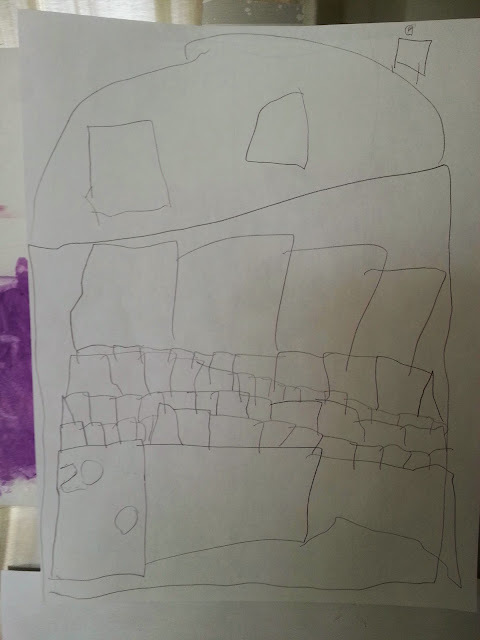 Griff drew a pic of our brick house yesterday. So, Griffin has show-n-tell once a week and each week they do a different letter of the alphabet. This week is letter "U". I struggled earlier this week with ideas of what to do (umbrellas, unicorn, underwear, united states?) and before bed last night, Tom and I suggested sharing a picture of one of his uncles. 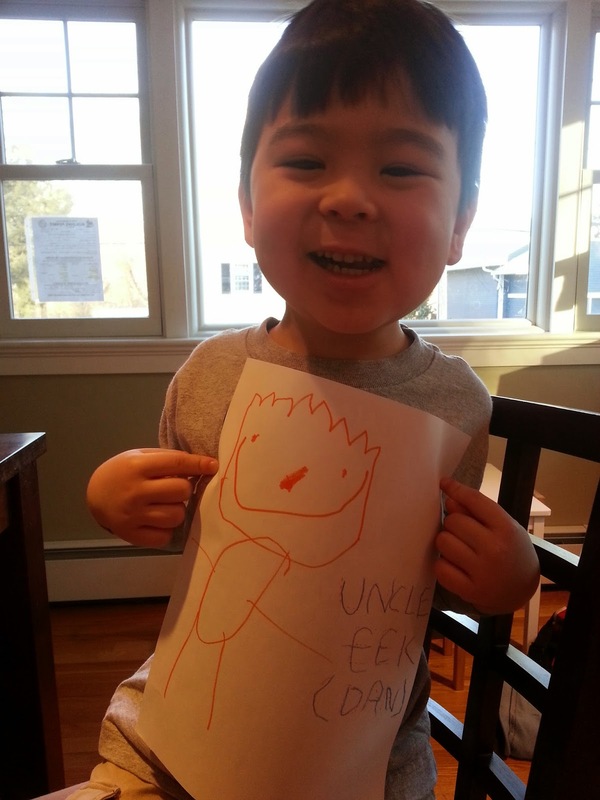 In the middle of naming all of his uncles, Griff got all excited and said, "How about Uncle Eek!!?" Done! 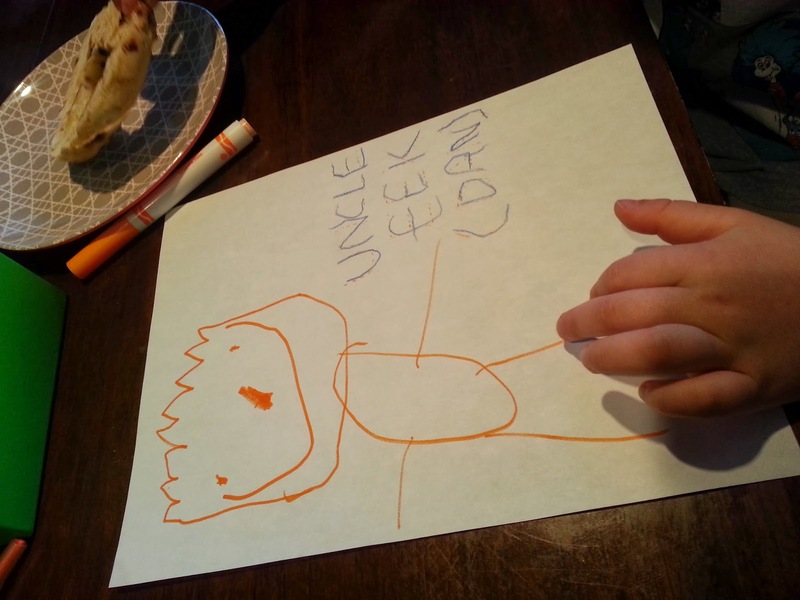 This morning when I showed the cow to Griffin, and explained that we didn't find a picture of Uncle Dan, and he said, "Hey, I could draw a picture." Great idea! He did, and it was so cute... He gave Dan (in his words) "spiky hair because he has spiky hair and a big nose". While he was drawing, he also said, "I have to leave room for Aunt Larissa." I said, oh but Uncle Dan is married to Aunt Annie and Uncle Eric is married to Aunt Larissa. "Oh". "Did you know that Uncle Eric and Aunt Larissa bought a new house?" "Well, how can they carry a house?" "They don't carry it, they just buy it and then move all of their stuff to the new house." "But I still want to go to their house to play." "Don't worry Griff, we can still go over to play." Griffin was well behaved and awesome last night. He did his own washing in the bath and cleaned up his room without supervision - I just asked once. While we were reading stories we played "opposite day" where you say the opposite of what you mean. Griffin said "I don't love my little sister Vera." That's what he came up with. 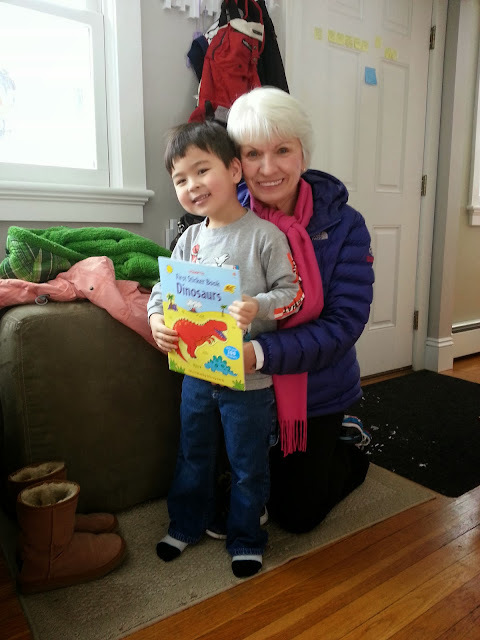 We read green eggs and ham and dragons love tacos and he laughed particularly loudly at my word-swap outs as we read. I love that lil guy. Griffin did an amazing job getting himself ready for bed last night.. He washed himself properly, got out of the tub and dried off, got his PJ’s out and put them on, brushed his teeth and peed, plus laid out his clothes for the next day and picked out stories to read. All while I was taking care of Vera. He was sitting in bed reading quietly when I came in for story time. Go G. I’m impressed. We gave him a random present from the closet of surprises. He deserved it. Griffin and I go to the depot for a lot of different reasons, especially now that the basement is under renovation. But the biggest thing lately has been for kids workshop time, which happens the first Saturday morning of each month. Griffin has built a race car, a tic tac toe board, a toolbox, a ship, and now a Trojan horse bank. He has a little orange apron with his name on it and he collects pins for completing each project. There are always nails to pound and glue and paint to make a mess with. The last one even had some screws. He's getting pretty good at hammering nails. Makes a Dad proud. Out of the blue today, in the car on the way home from Vera's swim class, Griffin said "You know Mom, Curious George goes to sleep naked in his bed. He doesn't wear any pajamas." That crazy monkey (and Curious George is also pretty crazy too).